Well, this was it. 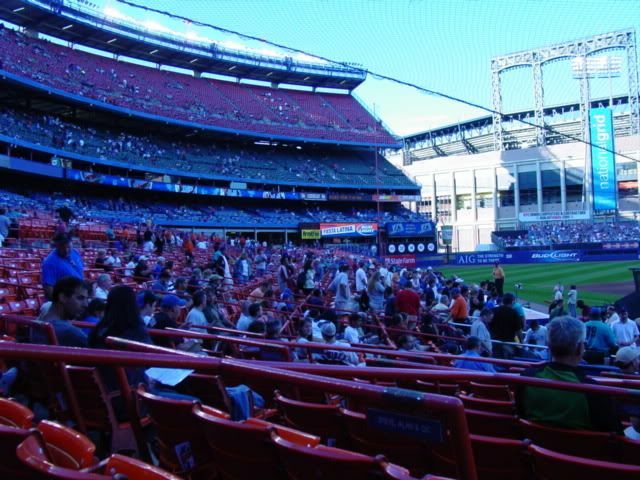 This would be our last trip to Shea Stadium. Kind of makes the eyes a bit misty even typing about it. 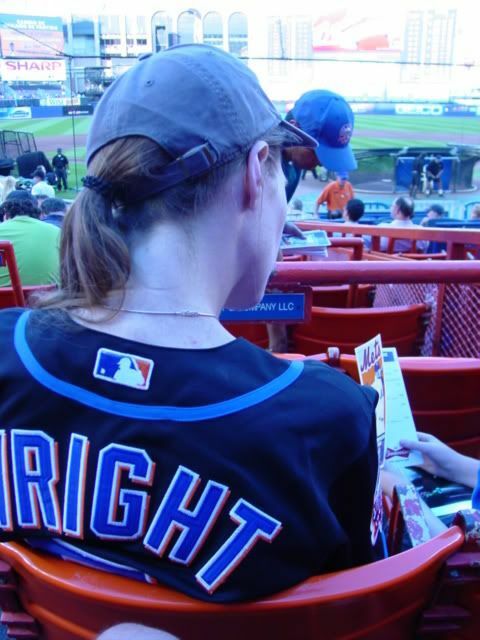 Jill and I did our best this season to take in the 'last season at Shea'. This would be our fourth and final game at this grand old stadium. Our schedule over the next month or so doesn't give us any 'free' time to make one more jaunt, so today would be our swan song. The day started out, however, in Manhattan. Jill had a meeting at New York-Presbyterian Hospital on the upper east side, so Mike and I tagged along. 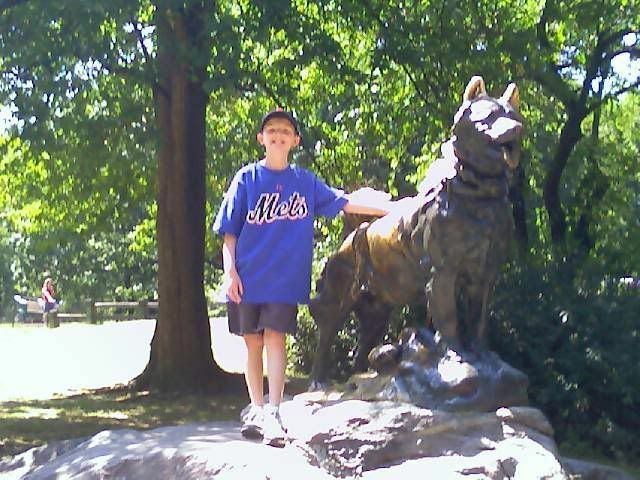 While she was meeting, Mike and I walked over to Central Park and took in some of the sights there, including the statue of Balto that Mike wanted to find. From there we walked about the 5th Ave area near Central Park before meeting up with Jill after her meeting. 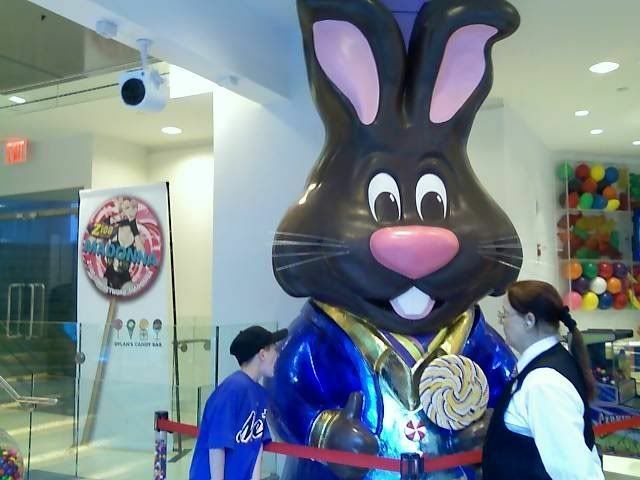 We grabbed a quick dinner at Patsy's Pizzeria on East 60th Street, and then wandered around in Dylan's Candy Bar which was across the street from Patsy's. We made the walk back up to 70th to get the car and then it was off to Shea! As I said, this would be our last game at Shea, and we were saying goodbye to the old barn in style! 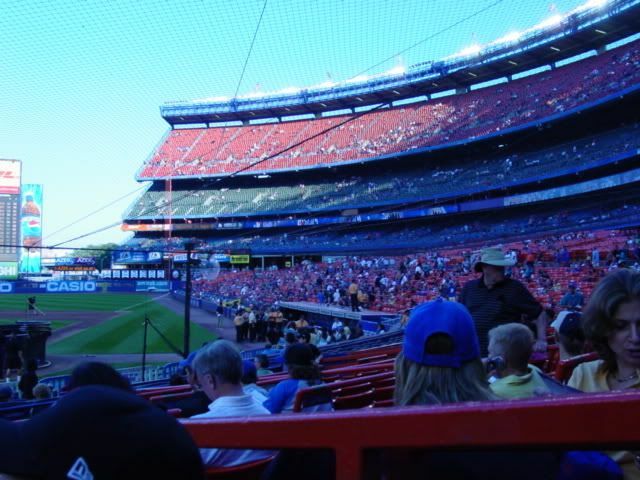 Seats behind homeplate, similar to those we had on Father's Day, and on the mound - Johann Sanata versus Roy Oswalt. A classic pitching matchup for sure! 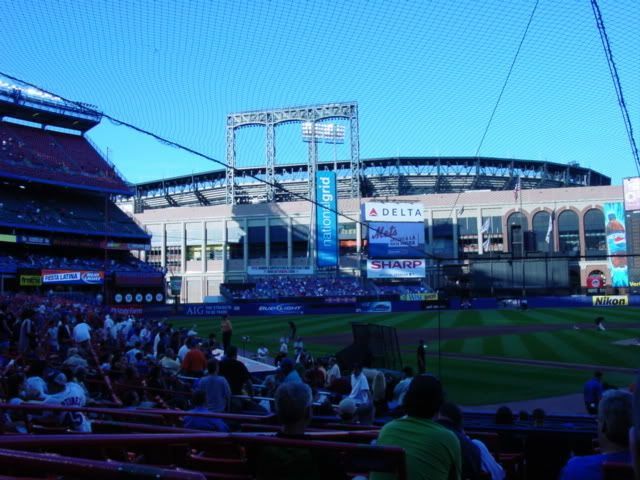 The home team won out again, and we left Shea for the last time, with CitiField in the background, confident that our new digs would hold the same history and magic as the old. Third base side from out awesome seats! NEW YORK -- Before the Twins were slick enough to get their hands on Johan Santana, he and Roy Oswalt were Minor League teammates in the Astros' system and professional friends who admired each other's work and understood how dominating each other could be. Their careers intersected again in Houston on Aug. 2, with neither pitching particularly well. But when Santana drew Oswalt as an opponent again Friday night, he suspected a more effective performance would be required. So it was that he went forth with nothing in mind. A row of zeros is what Santana thought would be necessary, a row of zeros is what he provided. And when his bullpen backed him with two more, the Mets had cleverly disguised lots of nothing as something and beaten the Astros. Santana's pitching, two clean innings by the bullpen and the Mets' increasingly remarkable ability to score early were the primary components in a 3-0 victory that was the first-place Mets' 10th win in 11 games and 10th shutout this season. Four times in their past 15 games, they have held their opponent scoreless and given new meaning to the phrase, "Nothing's doing." "Pitchers are rather fond of zeros," Tom Seaver once said. And Santana found no grounds to dispute that. "You don't have to pitch a shutout to win," the lefty said Friday night. "But it's much easier if you don't give up runs." And so for the fourth time in 27 starts this season, Santana made it easier. He followed his first National League shutout with a flawed but effective performance that put his ERA at 2.64 and eventually put his record at 12-7. He allowed eight hits and a walk in his seven innings, one more than his manager had thought he should pitch. He struck out five before Aaron Heilman and then Luis Ayala secured his fifth straight victory, and the team's seventh in his nine most recent starts. To complete seven innings, he needed 121 pitches, more than he had thrown in his career and the equal to the high for a Mets pitcher this season. But who was counting? Jerry Manuel for one. The Mets' manager, rigid when it matters most, wanted Santana to remain seated after a less than taxing sixth inning. But, Manuel said, "He pleaded, he begged. ... He told me he'd be fine. He said he'd keep it to 115 -- he lied -- and he mentioned something about the other pitcher." Santana didn't want to leave before his buddy. "I mentioned that ... yeah. I didn't want to leave before Roy," the lefty said. "I've known him a long time. We were together for three years in the Minor Leagues. I know how good he is. I wanted to go as deep as I could." As it turned out, Oswalt went deeper. He pitched the Astros' first complete game -- albeit eight innings -- in 203 games, the last coming against the Mets in July of last year. But Santana's seven zeros trumped Oswalt's eight innings. A run in the first inning, driven in by David Wright's single, and a two-run home run by Brian Schneider in the second were what put Oswalt's record at 11-9. He allowed two other hits and walked no one. After Schneider's fifth home run -- his sixth hit in 10 career at-bats against Oswalt -- cleared the right-center-field wall, Oswalt retired 20 straight batters. "I told you," Santana said. "You can't give up runs when he's pitching." Wright's RBI total increased to 99 when he singled through a drawn-in infield that was an indication of what Astros manager Cecil Cooper expected from Santana. 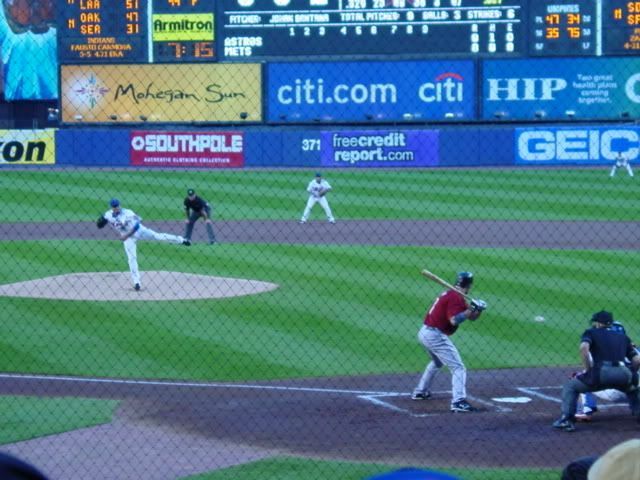 Jose Reyes had begun the inning with a single and advanced on a wild pitch and a sacrifice by Argenis Reyes. Schneider's home run, his third in his past five starts, was preceded by a welcome-back infield single from Ryan Church, who had returned after an extended assignment to the disabled list because of post-concussion symptoms. Shea Stadium greeted him with an ovation before he batted. "I didn't feel anything bad all night, and that made me feel good," Church said. Schneider and Church had come to the Mets from the Nationals in one trade last winter. Ayala, a third former National, earned his first save since he secured a victory over the Mets in the midst of their late-season fall, Sept. 27 last year. Manuel said the Heilman-Ayala sequence appealed to him. "You'll probably see it again," the manager said. And he liked the idea of his starter leaving only two innings to the bullpen. "You can't expect it, but I'll take seven scoreless anytime," Manuel said. He was taking nothing for granted. a-Struck out for Ausmus in the 9th. b-Grounded out for Oswalt in the 9th. 2B: Erstad (15, Santana), Tejada (28, Santana). 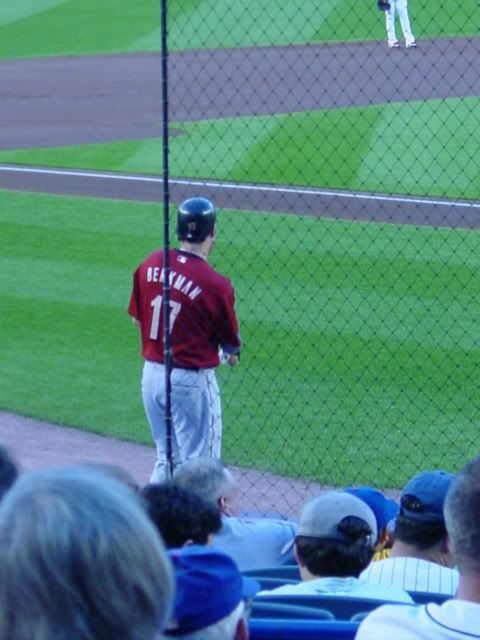 TB: Wigginton 2; Loretta; Tejada 2; Berkman; Blum; Pence; Erstad 2. Runners left in scoring position, 2 out: Oswalt 2; Blum; Berkman 2. HR: Schneider (5, 2nd inning off Oswalt, 1 on, 1 out). 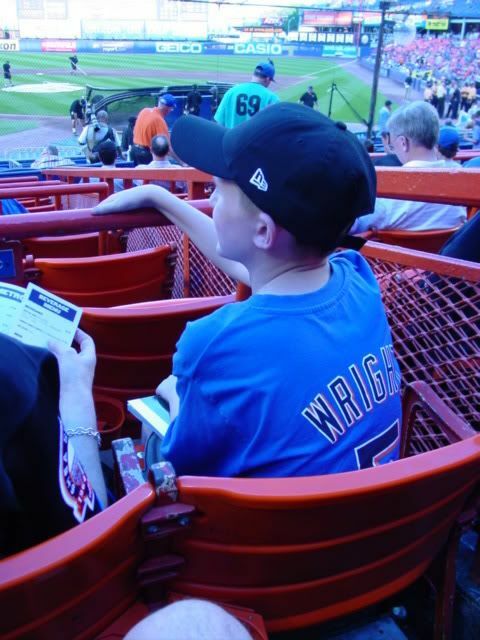 TB: Reyes, J; Wright; Church; Schneider 4. RBI: Wright (99), Schneider 2 (27). Pitches-strikes: Oswalt 102-75, Santana 121-86, Heilman 17-9, Ayala 11-10. Ground outs-fly outs: Oswalt 9-9, Santana 6-10, Heilman 2-0, Ayala 1-0. Batters faced: Oswalt 28, Santana 30, Heilman 3, Ayala 3. Umpires: HP: Mark Wegner. 1B: Wally Bell. 2B: Sam Holbrook. 3B: Chad Fairchild.